Although the newest upcoming Rainbow Six installment did not necessarily make the limelight at E3, it certainly deserves some recognition. During Ubisoft’s E3 2014 Press Conference, Rainbow Six Siege gameplay lasting over 6 minutes was first premiered for the world to see. Siege brings back a series of games that has not seen a new release since 2008 with a bang. Currently, the game is scheduled for a tentative 2015 release, but many would not be surprised if that date would be carried over to the following year. The gameplay featured at E3 showed how much ingenuity the developers of Siege took when planning how the game would function on the latest-gen consoles. As opposed to a commonplace run-and-gun style of gameplay, Siege seems to place its focus on slower-paced strategy and being resourceful. The most noticeable aspect of this gameplay involves how the environment functions in relation to players manipulating it. The footage shows two opposing teams of 6 players attempting to secure a hostage within a large home. While the use of grenades, firearms, and riot shields is engaging, most viewers would agree that watching the players use the interior of the building for tactical advantage was most notable. The environment was extremely destructible insofar as different surfaces would react to explosions and bullets in different ways. Quoting game designer, Andrew Witts, “Our environments are based on a layered material system….So in some maps, players can't destroy certain things, but they can shoot through them." While entire buildings will not be collapsing, entire interiors of buildings very well may be. If players keep these physics in mind, they can utilize them in strategy for advancing and for flanking methods. For example, a player could use a breach-charge on a floor to get to a lower level or use one on a wall to create their own door to a room. Going further, players can knock down the upper portion of a thick wall to use as cover or just make small holes in walls to peep though. Not to mention, making holes in the walls, floors, and ceilings large enough for grenades or C4 charges to conveniently slip through does not seem too shabby either. The Rainbow Six series has always done a fair job with semi-destructible environments, but Siege takes destruction to a whole new level. While destruction may not be on the level of Red Faction: Guerilla, it is certainly awe-provoking. 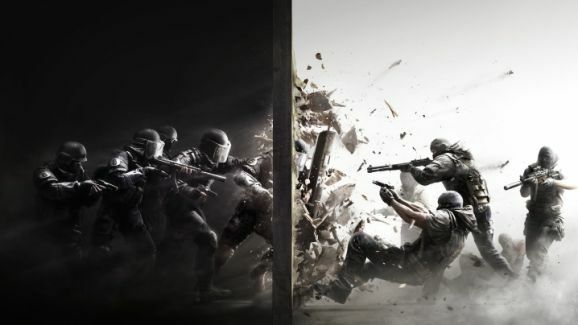 Going further, Siege seems to implement some aspects from its precursors within the series such as high-tension close-quarters and slowly leaning around corners. From what I’ve seen, the game makes you want to be very careful which corners you choose to risk your head with. I suppose that is why you would just punch a hole in a wall or use a camera to peep into the rooms and corridors that lie ahead, but that takes a little extra time than simply leaning. All said and done, it is nice to see the Rainbow Six series come back with a vengeance. Feel free to watch the E3 Rainbow Six Siege gameplay below, I highly recommend it.